First Man has the right stuff. Neil Armstrong. The first man on the moon. And this is the story of how he got there. What a journey of grit and spirit. It’s a great American story (complete with American flags) and it’s a great story of human endurance and ingenuity. And, for Armstrong (Ryan Gosling, Blade Runner 2049), the story is in many respects one of mind over matter. Armstrong was a classic stoic American. Reserved — at times too reserved — he held his emotions in check at all times. And that includes enduring the death of his 3-year-old daughter, a tragedy that challenged Armstrong’s soul and pressed him ever deeper into his work. Even so, Neil and his wife, Janet (Claire Foy, Unsane), persevered and became a major part of modern American history. Neil’s focused ability to manage his emotions and control his body — even as g-forces sought to turn him inside-out — sent him to the top of the class at NASA, into space and onto the moon. The setting is the 1960s and the U.S. is in the thick of the Cold War with the U.S.S.R. And there’s a race to space as the two world powers seek to extend their reach into the unknown. For the U.S., it’s not just a matter of pride, but global security. It’s refreshing to see smart people doing smart things on the big screen. Here, explosions and car chases are replaced with the firing of synapses. There’s nothing in Marvel’s canon that can hold a candle to this true story. And, as director Damien Chazelle (La La Land) tells it, using a screenplay by Josh Singer (The Post) based on James Hansen’s biography, there’s also room for some artistic license that pulls the story of Armstrong’s daughter, Karen, back into focus while he’s on the moon. Criticism has been drawn at the lack of prominence given to the American flag on the moon. It’s a silly criticism. The flag is there — but, it’s not the focus of the landing as it plays out in the movie. Chazelle turns the moon into a deeply personal and emotional experience with a surprising amount of intimate, emotional heft — and with hardly a spoken word. 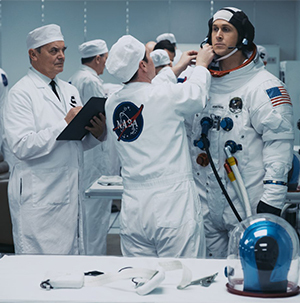 First Man sits comfortably with other related modern classics such as Apollo 13, Hidden Figures and The Right Stuff. The drama of the lives lost in the name of exploration and the groundbreaking science and mathematics behind the scenes is balanced out with a calm and understated humor, some of which takes its time to reach the punchline — in particular, there’s a scene involving a chalkboard and drawing, to scale, the current state of space exploration compared to where NASA wants to go. Well, okay, the guy was off by a little more than a smidge when his work is verified. And there’s also a night class surrounding “basic” rocket physics. The first class is intended to cover only Chapter 1, which boasts a hefty 604 pages. A member of the “shot on film” renaissance, the movie features a somewhat faded, grainy picture that helps capture the vibe of the ’60s. Sometimes the image even goes a little out of focus, which is interesting, but the overuse of handheld cameras causes some moments of distraction as the camera’s movements are made unnecessarily obvious.